I’ve always loved that quote, but until today, it’s never had any relevance to my life. Today, however, my father and I set off on our journey for my late sister, Jane. It’s been an odd day. 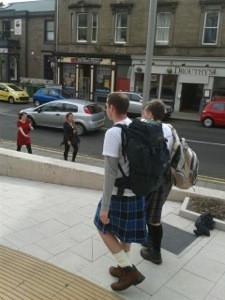 It started with a bacon sandwich and a kilt. One eaten, the other worn. Followed by an adventure around Duncan of Jordanstone with two journalists and a member of staff in desperate search for a suitable art studio to record an interview. Once found, the STV journalists positioned us and skilfully took us through the interview process. Watching ourselves on the 6 o’clock news was a surreal experience; but we were delighted with the outcome and the resultant increased interest in our website. At 12 noon we congregated outside Duncan of Jordanstone, beside the tree planted in Jane’s memory, with friends, family, and work colleagues. 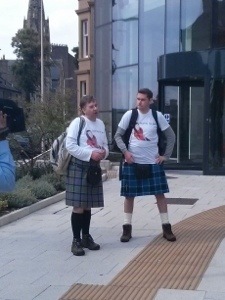 A few pictures, a speech, and fond farewells later, we set off to walk the Tay Bridge to Fife. This evening, as Dad and I got changed out of our kilts and freshened up for, what we believed, were a few neighbours dropping round to wish us well, we were suddenly surprised by the arrival of my girlfriend Julie, best friend, Gary, and close members of family. It was lovely to see everyone and we were touched by their words of support. Tomorrow, as they say, is a new day. We have a tight schedule to stick to; but, as the quote goes, in the process there’s no knowing where you might be swept off to.